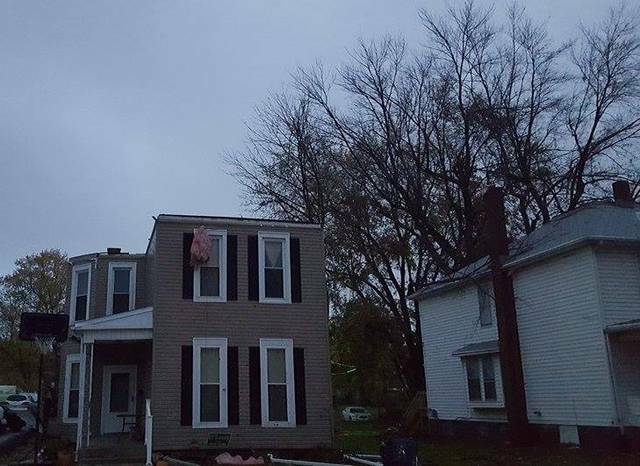 GALION — Despite a missing roof on his two-story home of 14 years, RC Teynor, who lives in the 300 block of South Market Street, is thankful this morning. 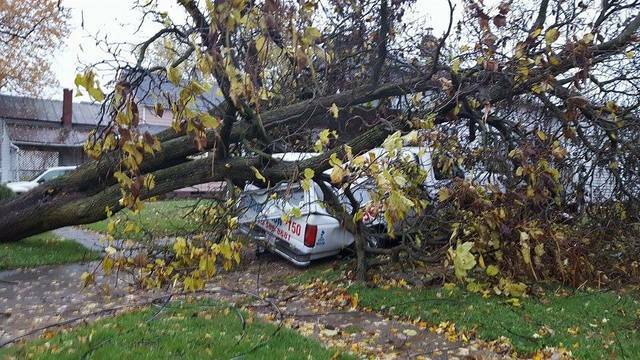 He was at home with a son and one of his son’s friends when Sunday’s storm hit with a ferocity he’d never seen before. Teynor told his the boys two get in the basement and he followed them downstairs. But the shaking and noise didn’t last long. Teynor was aghast at what he saw. The entire top of the two-story home was gone, but it’s not missing. One section was across Market Street, in pieces in the road. More pieces were in a yard east of his house. “My neighbor came out and said “Hey, I think part of your roof is over here,” Teynor said. Pieces of insulation from the attic were all over the block, one large piece of rolled insulation dangling from a light post. “I’m just thankful no one was hurt,” he said. Teynor’s wife was in Mansfield and called after the storm hit. “I told her not to come home, that the roof was gone, and I’d call her when it was OK,” he said. The Galion chapter of the American Red Cross found places for many storm victims to stay overnight. The randomness of the story’s fury was pretty evident. While his roof was gone and a tree across the street, roughly 10 feet in diameter had been uprooted, taking tons of dirk and part of sidewalk with it, the bikes belonging to Teynor’s kids hadn’t moved an inch from where they had been parked near a back porch. With the roof gone, his home sustained a lot of water damage. This morning, Teynor was back at his home during a little more damage assessment. He said the kids were fine and the family had been reunited. Galion City Schools were on a two-hour delay today. Damage from Sunday evening’s storm was severe but seemed to have followed a line, roughly from the 300 block of South Market Street to Harding Way East, about 10 blocks east of the railroad tracks. Several homes are not livable as either roofs were gone or parts of the home was caved in by falling trees and branches. At least two buildings sustained severe damage at Urban Industries. Flick Packaging will have repairs and cleanup to do. Several houses along East Walnut street were damaged and yards ripped up. Railroad tracks weren’t damaged but damage was seen to lights and other poles along the tracks south of Liberty Hill. On Harding Way East, power crews were working and street department employees were clearing debris this morning and roads were blocked. By 8 a.m., companies that specialize in tree removal were rapidly moving into the area. Many people without electricity right after the storm had their power again and residents were milling around their property and assessing damage. One home on Harding Way East, not far from Dollar General, lost an above ground pool when a tree crashed into it, spilling the pools contents. But a cleanup effort in Galion is well underway. RC Teynor’s home had its roof ripped off by Sunday’s storm. Heavy rain after the roof disappeared caused extensive water damage to the interior. 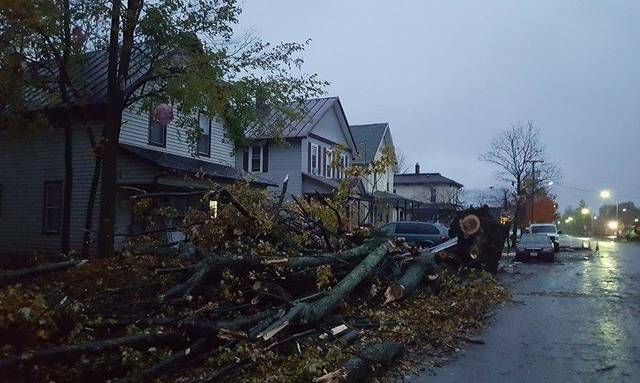 Galion city employees and others worked overnight to clear debris from roads and restore power to customers. This pile of debris was along the road with 300 block of South Market Street. A truck and home were damaged at this home in the East Walnut Street area.